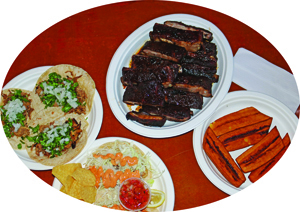 If you haven’t been to the Hideaway at the Diamond Cove Marina for their authentic Mexican, seafood, and house-smoked BBQ then you really haven’t experienced all that Montauk has to offer. It may be slightly hidden away but it’s certainly worth finding. 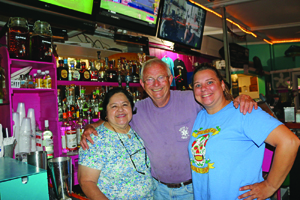 Ten years ago Freida and Skip Reichert had a dream to open a delicious restaurant at their marina incorporating her Mexican heritage background and skip’s BBQ talents. The result? 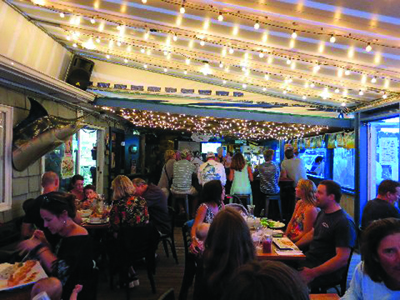 What used to be the best kept secret in Montauk. Open daily from 12pm—11pm you’ll find people enjoying their delicious fair and libations all day long. 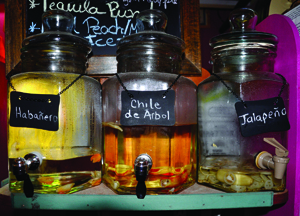 With over 40 kinds of tequila, the killer drinks are an added bonus to the fresh homemade dishes prepared daily, and whenever possible with fresh local ingredients. We have been fans for years, and yet with each visit we discover another flavor or dish that we add to our list of favorites. Consistency is never a problem and neither is the casual waterfront, friendly atmosphere- so we always enjoy introducing the Hideaway to friends. 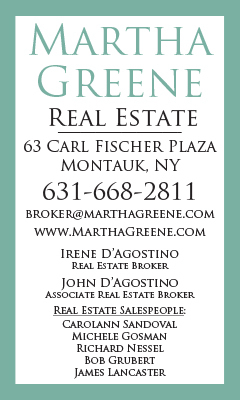 This visit with our friends from Hampton Bays was perfect as usual. Jamie behind the bar got us started with an Orange Spice and a Jalapeno Watermelon Margarita as we picked on the Fresh Salsa and Guacamole with chips. A special of the evening was Chayote –a potato/zucchini like vegetable that grows in Central America [Luffa comes from the vine]. It’s layered and gently fried and really tasty. 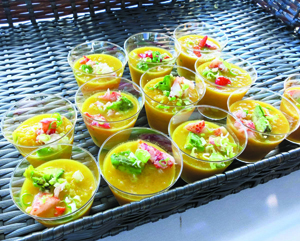 Every dish is so flavorful but not always spicy. According to Freda true Mexican food isn’t always spicy so the meal comes with sauces ranging from mild to flaming, but on the side so each diner can accommodate their individual taste and heat tolerance. We decided that most everything we ate had such delicious flavor the extra spice wasn’t necessary, we enjoyed the unique flavors and freshness of the food. From the appetizer selections we had the ‘never to be missed’ Mexican Corn on the cob smothered with spices, chipotle aioli and Cotija cheese, as well as the Sopes that can be ordered with a variety of meats, vegetables, or shrimp and topped with black beans, lettuce, Pico de Gallo, Crema, and Queso Fresco. Each appetizer is so tasty that sometimes I order a few and never get to anything else. The Tacos with either steak, chorizo, beef brisket, pulled pork, chicken, pork, chicken Tinga, or grilled vegetables are served on 3 corn tortillas; we had them with Skip’s amazing pulled pork. 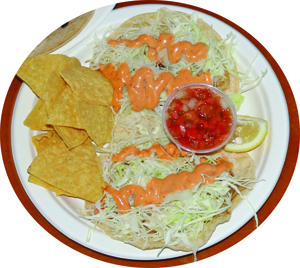 Another choice is a pair of Fish or Shrimp Tacos topped with shredded cabbage and chipotle aioli. I’ve had many different flavors and have loved them all, this time in addition to the pulled pork we tried the shrimp which was perfectly prepared with a generous portion of shrimp. We also enjoyed Skip’s St. Louis Style Ribs from the Barbeque selections. These fall off the bone ribs are served dry and so tender and full of flavor that although it’s available, no extra sauce is needed. As noted by our friends, even the coleslaw and potato salad are a fresh and tasty accompaniment. 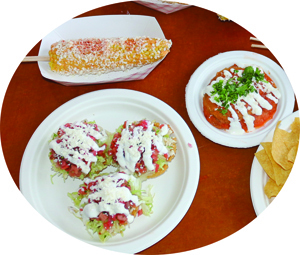 In addition to our selections, the menu varies from the traditional Mexican dishes like Flautas, Alambres, Enchiladas, Burritos, Quesadillas, Tamales, Nachos, and Stuffed Jalapeno Peppers, to Steamed or grilled Seafood, to hamburgers, Barbequed Beef Brisket, Pulled Pork, and Chicken. Fun, delicious, friendly and with indoor or outdoor seating available The Hideaway is sure to satisfy. 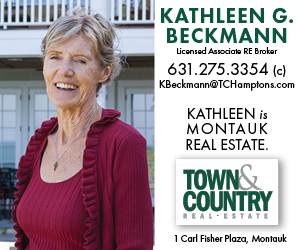 Taste of Montauk a Summer Success!